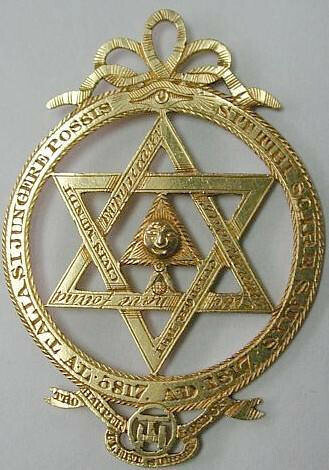 Seal of Solomon or the Shield of David, for under both names the same thing was denoted. A hexagonal figure consisting of two interlaced triangles, thus forming the outlines of a six-pointed star. Upon it was inscribed one of the sacred names of God, from which inscription it was supposed principally to derive its talismanic powers. These powers were very extensive, for it was believed that it would extinguish fire, prevent wounds in a conflict, and perform many other wonders. The Jews called it the Shield of David in reference to the protection it gave to its possessors. But to the other Orientalists it was more familiarly known as the Seal of Solomon. Among these imaginative people, there was a very prevalent belief in the magical character of the King of Israel. He was esteemed rather as a great magician than as a great monarch, and by the signet which he wore, on which this talismanic seal was engraved, he is supposed to have accomplished the most extraordinary actions, and by it to have enlisted in his service the labours of the genii for the construction of his celebrated Temple. In time, with the progress of the new religion, it ceased to be invested with a magical reputation, although the Hermetic philosophers of the Middle Ages did employ it as one of their mystical symbols; but true to the theory that superstitions may be repudiated, but will never be forgotten, it was adopted by the Christians as one of the emblems of their faith, but with varying interpretations. The two triangles were sometimes said to be symbols of fire and water, sometimes of prayer and remission, sometimes of creation and redemption, or of life and death, or of resurrection and judgment. But at length the ecclesiologists seem to have settled on the idea that the figure should be considered as representing the two natures of our Lord - His Divine and His human nature.